Intel, Qualcomm and Samsung have issued a flood of announcements all apparently designed to show how incredibly 5G-ready they are. Having regularly dropped the ball on mobile over the past decade Intel is especially desperate to be seen as a viable 5G player and is bombarding tech hacks with relatively open messaging intended to convince us of just that. Among the evidence Evans cited to substantiate her lofty claim was the launch of what was positioned as the first 5G modem earlier this year, and the MWC launches of a new mobile trial platform, a new LTE-A modem and a mobile edge computing portfolio. Also cited were the numerous 5G partnerships everyone with even half an interest in the ICT sector seems to have felt compelled to dive into, with Intel recently adding ones with both Ericsson and Nokia. You can see a summary of Intel’s current 5G messaging below. 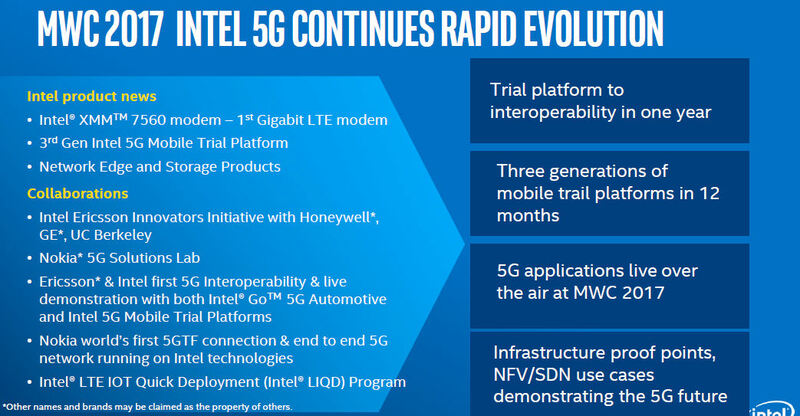 There’s no doubt Intel will be a significant player in 5G but this is more likely to stem from on its dominant position in the datacentre and cloud than anything else. All this banging on about modems and partnerships comes over as overcompensation for its historical mobile failings. Qualcomm is also having a pre-MWC 5G spasm. Among its PR spam is a release modelstly entitled ‘Qualcomm Showcases 5G Leadership with its First 3GPP-based 5G New Radio Connection’. It involves a prototype using the 3.3 GHz to 5.0 GHz band, which apparently demonstrated all the high bandwidth/low latency goodness expected of 5G New Radio. Lastly Samsung, perhaps partly to distract attention from its handset troubles, is trying to focus attention on its components efforts at the show. The most recent announcement concerns a trail conducted in partnership with Japanese operator KDDI in Tokyo to demonstrate 5G multi-cell handover using the 28 GHz band. Specifically the test took two forms. One involved a car travelling at 60 kmph between two base-stations on a highway. The second involved driving in the center of the city to demonstrate viability of the 28 GHz band in that environment. A peak rate of 3.7 Gbps was still achieved, we’re told. There was a bunch of other 5G spam along the lines of the above US chippies but at least the KDDI announcement was specific and substantial. Since it’s inevitable that everyone is going to bang on about 5G for the foreseeable future the onus is now on substance. Of course companies like Intel, Qualcomm and Samsung are desperate to be at the forefront of this era but they will need more than flowery, aspirational marketing language to make that dream come true.